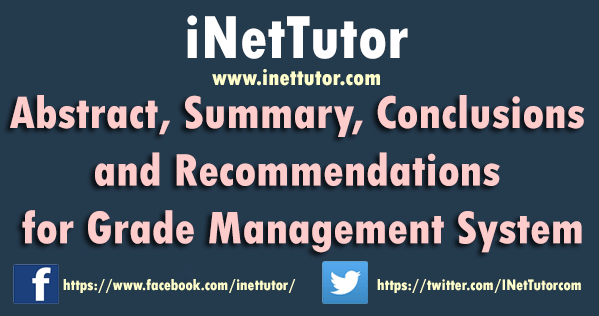 This article will provide you with a sample abstract, summary of findings, conclusions and recommendations of the study for Grade Management System. Generally, the aim of the study is to develop a Student Grade Management System that will promote awareness and transparency for the students, faculty, and school administrators in order to help improve in monitoring of the students’ academic performances. The modified waterfall approach was used in the design and development of Grade Management System utilizing a validated survey questionnaire to determine the end user requirements for the system. The system also underwent a series of evaluation to check as to whether it adheres to software quality standards using the criteria set forth by McCalls. Likewise, a User Acceptance Testing (UAT) was also conducted to determine the system’s acceptability based on the variables under studied and the end-user requirements. There was an evident need to develop the student grade management system based on the data gathered from the three different survey instruments such as: Importance of Grade Issuance to Students; Experiences of Faculty When Computing, Writing and Managing of Students Grades; and the Extent on the Need for the Development of Grade Management System. Findings shows that respondents answered the “strongly agree” for the 10 issues raised regarding on the Importance of grade issuance to students. For the difficulties encountered by the teacher, the interpreted results were often, sometimes, and always which implies that the IT faculty have really experienced difficulties in the management of their students’ grades. Finally, results of the study revealed that the respondents have strongly agreed that there is a need for the development of the Student Grade Management System. Based from the findings, the researchers conclude that it is very important for the students to be informed of their grades, and to determine the status of their academic performances on their subjects per term. Also, teachers have experienced some difficulties when computing, writing and managing their student’s grades. And lastly, respondents wanted to enhance the system that is a user friendly, ensure speed, accuracy and efficiency for the student grade management. The researchers recommend to the school to implement the developed system in order to solve the grade transparency problem which was experienced by the students and thereby promote grade awareness in the school. The Grade Management System is software that will manage the students’ grade of students. The objective of the study is to give solution to the grade transparency problem of students and make them aware of their academic performances. In developing the software the researchers conducted a survey to get the system requirements and to find out if there is really a need of developing a student grade management system. The respondents were students and teachers of the computer related courses. The result of the survey is very high showing that there is really grade transparency problem to be solved. With the survey result showing that there is high percentage of students and teachers who strongly agreed that there will be development of Student Grade Management System, the researchers continue the study to help the department in its grade management records and make the students get aware of their grades. After the researches got the system requirements using survey questionnaire, the system design was made immediately. The researchers used the PHP and MySQL as the backend of the system and Bootstrap as its front or Graphical User Interface (GUI). After the system development, the researchers conducted a User Acceptance Testing (UAT) to determine the acceptability of the proposed system in terms of its Information in the Program, Ease of Use, User Interface, Speed, Accuracy and Security. In general the mean interpretation was “strongly agree” which showed that the proposed system was accepted. Based on the findings, the researchers conclude that the proposed system adequately met its objectives and that was accepted by the intended users in all terms of its functionalities. And therefore, the researchers recommend to the school to adopt and implement the Student Grade Management System in order to promote grade awareness and thereby improve the school’s grade management system. The Grade Management System is acceptable with regards to speed. The Grade Management System is acceptable with regards to security. The Grade Management System is acceptable with regards to accuracy. The Grade Management System is acceptable with regards to efficiency. Grade management system is specifically for IT department which helps in students’ grade transparency. We recommend to the school to implement the developed system in order to solve the grade transparency problem which was experienced by the students as being discussed in the previous chapters of the research. The possible administrator of the system must be the chairperson of the department to make sure that the person with full access to the system is creditable enough to hold its overall information. The possible location for the system implementation should be in the ICT office where there could be software compatibility or it could be implemented in every school’s department and provided just at least one stand-alone computer unit. It is further recommended to train possible users of the system for its maximum efficiency. The future researchers may conduct studies in the other departments regarding grade management. They could also make a registrar automated grade issuance for wider scope that may help in the school’s success. They may also use the student grade management system and integrate it to the registrar’s grade issuance for the betterment of the software.